Poppy Cottage01263 715779work01603 870304fax Self-catering17th Century Poppy Cottage with its low doorways and original Pamment floors is the perfect place to relax and enjoy the North Norfolk coast with the coastal town of Sheringham only 3 miles away. Bodham has a village shop and a traditional pub serving excellent meals. • General: Thermostatically controlled electric heating and multi fuel stove. • Access: For one car, shared driveway. 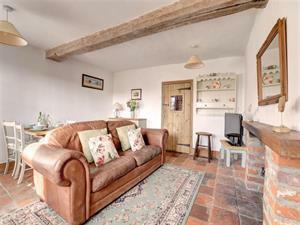 17th Century Poppy Cottage with its low doorways and original Pamment floors is the perfect place to relax and enjoy the North Norfolk coast with the coastal town of Sheringham only 3 miles away. Bodham has a village shop and a traditional pub serving excellent meals.